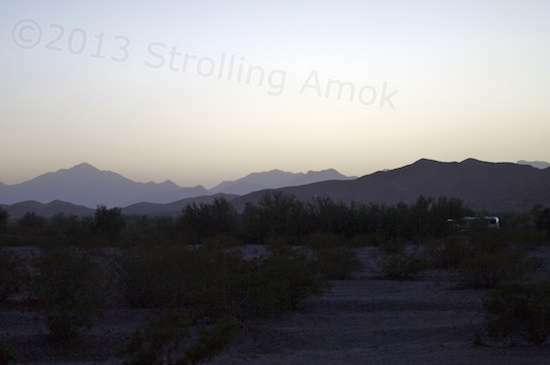 The photo above is simply one taken after a cloudless sunset. Even with some digital massaging, the many layers of mountains forming the background aren’t really discernible. You gotta be there to see it (or I need to learn how to use that camera better)! The existential essence of a bike tire. Since this is a British-brand bike, maybe I should say bike tyre. The photo above is my bike’s front tire. I figured that it has earned some recognition since the long series of leaking inner tubes is over now, thanks to a pair of super-thick Slime tubes that are working great. They’re heavy, but when all you care about is getting there, they do the job. These are the Raleigh’s original 1993-ish tires, which are showing no signs of disintegrating in the sun. 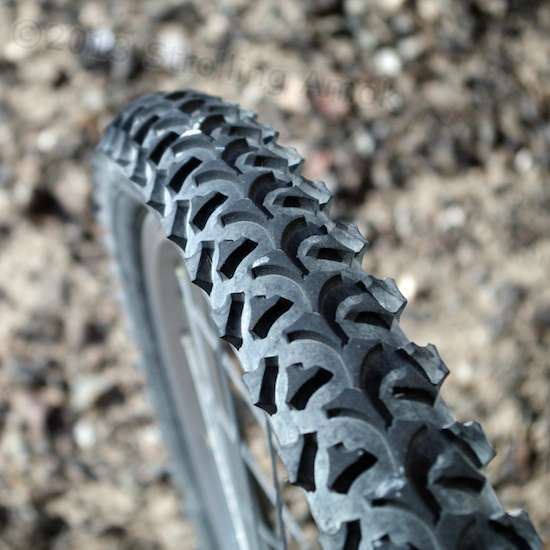 The tread design is superb on both gravel and pavement, since the linked center rib eliminates the unnerving vibration common to many aggressively-lugged bike tires. The bike’s Shimano derailleurs and shifters aren’t too happy with all the grit and dust out here, but are hanging in there when used regularly.